What a year 2016 has been for all of us. It seems now more than ever we all need a little escape and to take some time to enjoy the good things in life, and Orlando is the perfect place to do just that. And perhaps while you’re here, in the vacation capital for millions of people, you would like to make a positive impact, to give back to the place that has given so much to so many. There are many volunteer opportunities in Orlando. With all its charm, magic, and fantasy it is sometimes forgotten that Orlando is a real place, with real people, and faces the challenges that many other communities face. In the spirit of the holiday season and as we wrap up such an interesting year, I’d like to share with you some charities and organizations that make a distinct difference in Orlando. Some of these are personal favorites in which I am involved, others are suggested organizations from friends and other prominent members of the Central Florida Community. Find something that speaks to you and consider making time in your next Orlando vacation to volunteer, or set aside a little bit in your budget to make a donation. Do you load up your suitcase with those little bottles of hotel shampoo and conditioner? Did you know there are organizations that collect bottles of unused shampoo, conditioner, lotion, and shower gel, as well as unused bars of soap all left behind in guest rooms? Clean the World is the largest of such an organization and they got their start in Orlando! Hotels that participate with Clean the World train their housekeeping attendants to collect the unused bottles and bars and place them inside special shipping boxes that are sent to Clean the World’s sorting warehouses. There is one warehouse in Orlando and one in Las Vegas. The unused products are sorted and sanitized. The soap is reformed into larger bars of soap and sent to impoverished countries, including remote villages where thousands of lives are often lost to disease that could be prevented just by the regular use of soap. The other products (shampoo, conditioner, lotion, and shower gel) are sanitized and then packaged into care bags that are distributed to shelters and centers to be given to anyone facing hard times and in need of such products. You can volunteer at the sorting warehouse. It’s easy and fun! Anytime I’ve volunteered here they’ve played energetic music and groups gather around tables to sort through the products. Often times you’ll be volunteering alongside Disney Cast Members and other hospitality industry personnel. Shifts are available in three hour increments so it’s easy to fit into your schedule. Or if you prefer to make a monetary donation, you can learn more here. One of the easiest things you can do is ask if your hotel participates, and if so leave behind all unused products so they can be collected for Clean the World. (All Walt Disney World owned and operated hotels, as well as the Walt Disney World Swan and Dolphin, do participate). Perhaps one of the most well known charitable organizations in all of Central Florida, Give Kids the World is an ideal choice for visitors wanting to donate or volunteer with a local organization. Give Kids the World Village is a magical resort that allows families with a child facing a severe illness to enjoy a week-long vacation in Orlando, for free. I’ve volunteered here many times over the years. One of my fondest memories is the weekly volunteer shifts in which I would operate the village’s carousel and blue train that transports guests throughout the resort. Give Kids the World offers some of the most fun and unique ways to volunteer in all of Orlando. Donations go a long way here, so if your time is short consider a donation instead. In recent years a brighter light has been shown on just how many people do not have adequate food on a daily basis. Throughout the country there are food banks and pantries; a great effort to witness. 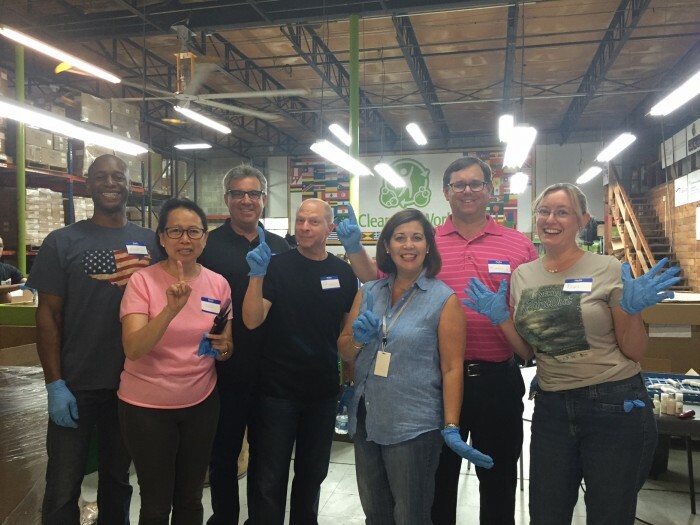 Here in Orlando there are a number of resources, but the largest, and the one with the highest capacity to reach the most people, is Second Harvest Food Bank of Central Florida. Many businesses around Central Florida partner with Second Harvest, even donating unused food supplies. Even more gratifying is that donating to Second Harvest gives you more bang for your buck because they are able to stretch a dollar far more than a regular consumer. You can learn how to donate here. Volunteering here is lots of fun too because you can either sort through donations or become part of the food production line! It is hard to imagine in such a friendly and welcoming place as Central Florida, that there are people who face some very dark situations. Harbor House of Central Florida provides the most expert of care to victims of domestic abuse. The work they do is pretty incredible. Not only do they provide a safe haven, but they work tirelessly to educate the community about domestic abuse, how to Recognize, Respond, and Refer. They also partner with law enforcement to ensure they respond effectively and with empathy. Because of the nature of the Harbor House, the process to become a volunteer is a little involved, but definitely worth it. If you wish to donate, please visit their site. This Summer something happened in my city that I still am in shock over, and I am certainly not alone. The Pulse nightclub shooting brought a spotlight onto our community, in a way that we never dreamed, and yet it showed our true colors. We are united. So many organizations continue to step up to help those affected by this tragedy. One of those organizations works tirelessly to be a safe haven for members of our community who might otherwise feel like an outcast. The Zebra Coalition is headquartered inside a modest home in one of my favorite neighborhoods of Orlando: Mills 50. This district is artistic, creative, and now has countless tributes to the Pulse victims and survivors sprinkled throughout. Orlando, like so many American metropolitan areas, is diverse and inclusive. Next time you’re in a theme park or hotel in Orlando look around you and take notice of all the different walks of life, both guests and employees. Zebra Coalition provides counseling and other services to members of the LBGTQ+ community and others in need of guidance and inclusion. To get involved, click here. These are just five of Orlando’s many organizations and charities that need our help. No other place in the country welcomes more visitors annually, and we Orlando residents do so gladly. If you can find time in your vacation to help make a positive impact on this community, please do. You can find a full list of Orlando based organizations here. Thanks for getting involved! OK, I am the first to admit that after being bombarded by requests to Give in the last week or so, I opened this post with a … shall we say less than positive outlook. Grinchly would be a stretch, but tending in that direction. In the end, though, I was really interested to read about the organizations that you chose, and especially ones that are linked to the tourist industry in a way that makes them relatively unique to Orlando and a few other tourist destinations. That you chose a couple that are easy to give a bit of time to while on vacation was really nice, and I actually would consider volunteering given that it could be a simple commitment. Thanks! Thank you for highlighting these important organizations. My husband and I had a wonderful time volunteering at Give Kids the World last weekend. It was the best pary of our trip–even more magical than Diagon Alley and Hogsmeafe. Thank you, Dani. Thank you for useful information. Thank you for reminding us tastefully and tactfully how and why we can make a positive difference. Give Kids the World is wonderful. I know many people who have volunteered there (My church was very close to it when I lived in Florida) and one of my high school friends from Michigan did a vacation there with his family. They had an incredible experience and could not say enough good things about what they do there.